As long as I’ve paid attention to American soccer, Charles Boehm has been the guy doing much of the heavy lifting for the MLS content team. He first started contributing for MLSsoccer.com in 2004, then quickly transitioned to being the DC United beat writer for the next six years. In 2012, he became an editor for the site and continues in that position to this day. Aside from writing analysis pieces and running with creative approaches to journalism, his name is often the one on the gameday match reports, providing the daily content a site needs to thrive. My favorite aspect of Boehm is his willingness to support the little guys, without reward. I originally met him when he was a guest on my podcast and he treated me with dignity and respect, even though I was just some guy working out of a spare bedroom. What is clear is that he loves soccer and has been around it long enough to see the ups and downs of the current system. Most importantly, he’s a guy who has thought through the big issues and isn’t afraid to share his opinion. One note. Unlike many other interviews where I have a large number of photographs to choose from, Boehm is a writer’s writer - not much photographic evidence. Hi Charles, tell us about yourself. Hey there everyone, my name is Charles Boehm, my friends call me Charlie, I live in the District of Columbia and write and edit for various soccer websites, mainly MLSsoccer.com at present. What clubs do you follow? I have played and followed the game nearly all my life dating back to age 5, but truly “supporting” a team, at least one on this continent, has been kind of felt off the table since I got into the journalism side of things. The closest thing I have is FC Barcelona (points for originality, I know). I started following Barça around 2001 or so, while living overseas in a place where their matches were broadcast regularly, and fell in love long before the Messi era. Alas, my life these days does not allow me to watch them as religiously as I’d like, but I catch them when I can. 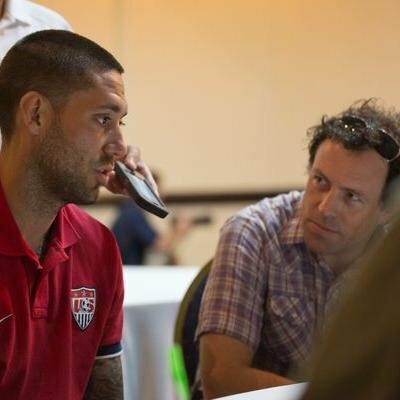 You've built a career in soccer journalism, how has the profession changed over the years? I guess I get to claim this as a “career” – feels like most of us are just barely hanging on sometimes! This is a good question but a very big one, and I’ll try to keep it brief. The soccer media in the United States (and for the most part Canada as well) has grown enormously in the 15 years or so I’ve been working in it. The game’s general expansion in size and attention across the board has made for more jobs, more opportunities. But this is happening alongside, and interwoven with, the wider media industry’s slow, agonizing descent towards death or some similar post-apocalyptic fate. American soccer is huge but highly balkanized; it’s hard to get to a critical mass of interest in any one team or scene besides perhaps “the US national teams” at best. So there’s still not enough clicks, or money, or jobs, or stability to make it a sustainable place to build a career. And thus we’re still chronically falling short on basically every level: Quality, diversity, intensity, depth, etc. How much journalism should be from a league site versus independent sources? Do you see that as a conflict? Is it a necessary evil? Ha, in a perfect world there’d be a huge, thriving ecosystem of independent media covering all levels of the North American game, providing fans with a range of options in terms of depth, voice, location, etc. Right? Of course! And it’s natural for us to look to the examples of world-leading, “soccer-first cultures” etc. where this is the case – Spain, Germany, England, Argentina, even Mexico, and plenty of others. But we don’t have that, do we? We’re nowhere near it, with all due respect to myself and my many amazing colleagues, the majority of whom work at a discount, or for free altogether, because we love the game and want it to be better covered. It’s probably worth pondering a little bit why that is. I know I certainly do. I personally have been around long enough to have seen that the development of league and club (and federation, and tournament, etc etc) sites providing coverage of themselves by and large arose in response to that reality, rather than being the cause of it. And when/if there are more jobs in independent soccer media, they would be aggressively pursued and filled by a large workforce which has to some extent gravitated towards team/league sites. In my experience, team and league sites, even in spite of challenges like more layers of oversight than independent outlets, can undoubtedly help fans, add value to the landscape, add to the conversation. Even if you look just at strictly on-field-related content, they tend to be information-rich in terms of stats, data, video, social media and sometimes onsite coverage. The matchcenters we run at MLSsoccer.com are a buffet of info for a broad spectrum of fans and other observers. You're very plugged into MLS sources, how does the league view the amatuer base of the pyramid? Or does it not at all? Nah, I don’t know sh**, y’all! But to try to answer seriously: Look, there’s animosity towards MLS among members of the amateur and semi-pro game, and not without some justification. But MLS is packed with people who love this sport in the same way they do, and in most cases lived and/or worked in the lower divisions at some point(s) on the way to where they are now. My personal opinion is that the federation (and that includes MLS, its top-flight men’s pro league and longtime partner) can certainly do a better job of overseeing and leading the overall community. The interests of different divisions inevitably diverge in some situations; a good federation provides guidance, fairness, consistency, leadership, etc. I don’t think it’s unfair to say there’s room for improvement there. Follow any lower league clubs? As a soccer dork at heart, I keep an eye on and routinely geek out over all parts of our weird, wild pyramid. I don’t get to go to all that many games anymore, at least since my wonderful daughter was born five years ago, but I try to catch at the very least one early-round US Open Cup game every year. I’ve got a soft spot for our local DMV heroes Christos FC, for the same obvious reasons that they charmed the pants off everyone else who heard about them in 2017. Pro/Rel - For it/Against it? Is it a possibility in our system? I don’t think this is really a yes/no question, but short answer: Yes, I dig pro/rel, and in broad terms it is a possibility here. It’s one of the things that makes soccer unique and holds real competitive benefits to players, coaches, leagues, clubs, communities. Unfortunately, that system’s roots grew up in different soil, metaphorically speaking, than ours, and that means that it’s a relatively unfamiliar concept to North American sports at large, and that poses multilayered problems. Andrei Markovits and Steven Hellerman did a great job of illuminating the deeper sociocultural factors behind this in “Offside: Soccer and American Exceptionalism,” one of my favorite books about our sport. Pro/rel both sustains and feeds off the sport’s deep cultural moorings in a given country or society, and solves the fundamental problem of ordering and organizing a teeming ecosystem of clubs all vying for the highest possible station. North America is not the same environment and our solutions/evolutions will not be exactly the same, either. If/when it arrives in the US/Canadian pro systems, pro/rel here will probably look different from elsewhere. I can definitely say that implementation will require some visionary leadership that understands the value of the core concepts and charts both the leagues and federations on a long-term path to get there. MLS, for obvious business reasons, seems opposed to pro/rel. How does that change? I always caution people not to assume that MLS is a monolith. Yes, it’s a single-entity system with more central controls than other leagues, but there are plenty of people at the ownership/executive levels who dig p/r, or are at least open to it if it makes them money or improves their business. The league’s growth in size has led to more diversity in the backgrounds and mindsets of owners/investors, and that’s a good thing, both in general and for p/r. I’ve believed for a while now that eventually MLS decision-makers will realize that the concept of pro/rel is a powerful one that they can harness for their benefit, rather than just avoiding indefinitely, and implement some version of it. Purists and firebrands will scorn this as a watered-down, co-opted version of it, but it’s a starting point, and probably the most realistic path to p/r. We've seen a lot of changes in journalism in the country, what changes do you love/hate? Yikes, it’s mostly bad – the industry seems to constantly grow smaller, weaker, shallower, poorer and more dysfunctional, and I don’t know how the negative trend lines get reversed. Not too many bright spots aside from the democratization of access and diversification of what’s covered and by whom. Is Atlanta United the most talented MLS club of all time? Hmmm, probably. The early DC United teams and the Beckham-Donovan-Keane Galaxy teams of 2011-12 are the only ones I can think of in that neighborhood. Track any of the developments in Chattanooga? Any thoughts? The fan ownership initiative is awesome, of course, and a savvy move given the context of a) USL coming to town (that whole thing is pretty baffling to me) and b) NPSL Pro coming down the pike in just a bit. It would be wise of all the NPSL Pro teams to find similar rallying points or gambits, not only to raise awareness of themselves and their upcoming new league, but also to hone the identity that most of them are trying to build as local, independent, grassroots and populist clubs. I'm not entirely sure that fan ownership is a scale-able and sustainable approach for the pro level in US and Canada, mainly because the costs have become so enormous, and ownership such a rich person's game, even at the D2 level. But it's worth exploring, and always better to light a candle than curse the darkness. If you could have a meal with any player - dead or alive - who and why? Also, what meal? Tapas with Johan Cruyff, of course!